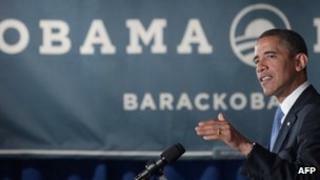 US President Barack Obama and the Democratic Party raised $43.6m (£27.4m) in total in April, his campaign says. The figure, down from a March total of $53m, excludes major fundraisers from early May, one of which raised $15m. Mr Obama will battle presumptive Republican nominee Mitt Romney in November for the White House. The Romney campaign has until midnight on Sunday to file its fundraising report for April with the US Federal Election Commission. Although Mr Romney's direct campaign funding has lagged behind the Obama campaign, Republican super political action committees (super PACs) are spending millions of dollars backing his candidacy. Its first video release used Mr Obama's words against him , highlighting what the group said were a string of broken promises over his years in office.